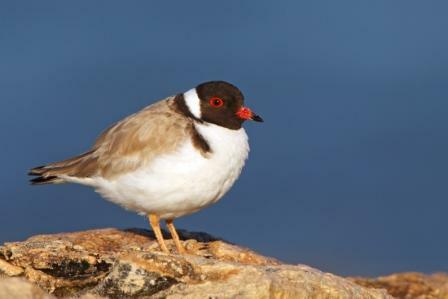 Wader Quest: New Project: Hooded Plovers. On Thursday evening we heard from BirdLife Australia that they were happy for us to raise some money on their behalf in support of the Hooded Plover project. 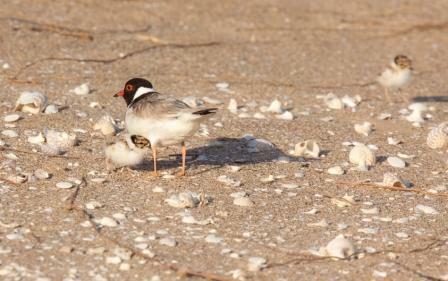 Hooded Plover: Photo Dean Ingwersen. "Volunteers and communities along Australia's southern coastline are working with BirdLife Australia to save the Hooded Plover, one of Australia's most vulnerable bird species, that attempts to raise a family alongside thousands of beach-goers. Since 2006, over 1,000 volunteers have worked to find and protect nests, and to raise awareness of the plight of the 'Hoodie'. We have successfully increased the breeding success 10 fold on the beaches experiencing high human use, giving birds a 50% instead of 5% chance of producing young! This has paused the decline of the species but in the face of escalating pressures from coastal development and recreation we need to continue this work. Please help us by donating at www.savethebirds.org.au/" - Grainne Maguire, Project Manager, beach nesting birds, BirdLife Australia. 'Hoodie' chicks: Photo Birdlife Australia. Up to now this project has been funded from government funds, but recently this funding was cut as it "did not meet investment priorities"! The project now needs to come up with some Aus$25,000 to fund the coming breeding season's activities. Wader Quest has been collecting donations at the British Birdwatching Fair, so if you are going to the fair and care about the "Hoodies", visit the stand marquee 1/67 and make a donation which will be passed on to BirdLife Australia. We hope that when we visit Australia next month we will be able to visit the project and see what is happening first hand, and to get involved in some ringing. Hi Rick, this project is also being done in Western Australia, NOT just in the Eastern States. Have forwarded this email on to our Hoodie Project Officer here in Perth.